The EZ will be used to target and boost the significant growth opportunities in the banking and financial services, digital media and creative industry and IT and communication companies, many of which are already established in the area. In order to encourage new businesses, there will be a Enterprise Zone Relief, where eligible businesses can get up to 100% discount for a maximum of 5 years. £73 million has been allocated by the council for the Business Rates Relief. There will be improvements on the Metro, with £25 million being spent on extending the line, and a further £18 million will be used to improve public footpath infrastructures. Bradford House is located in the Southern Gateway district of the EZ, an area identified by the council as mixed-use development opportunity. Prosperity plan on creating a 7-storey, 49 unit apartment block, with a commercial unit on the ground floor. The development is due to complete in Q4 of 2018, and is one of the prime areas being developed as part of the Big City Plan. 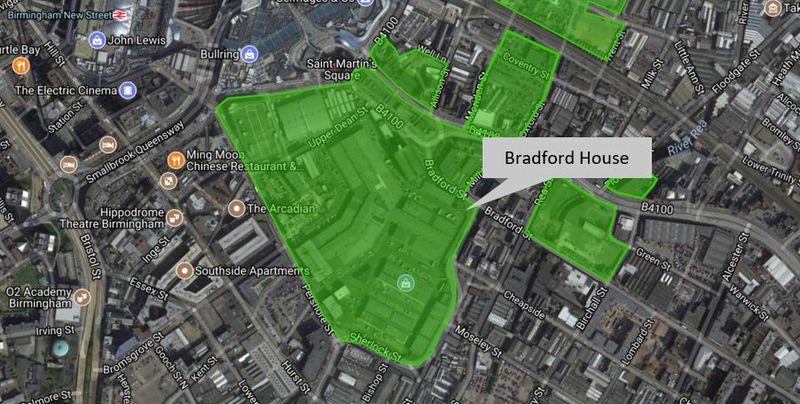 With the help of CrowdLords Investors, two investment options for Bradford House have already been funded. Our Interim Equity option is still available, and produces a total return of 30% over a two year investment term. Kent House is located, on the fringes of the Southern Gateway EZ. A you can see from the map above, it is quite centrally located, and is closest to Birmingham’s China Town, a popular area for international students studying in one of Birmingham’s universities. CrowdLords currently has Full Equity and Interim Equity investment options available. CrowdLords investors. Click here to learn more about this development. Edward Street is another recent investment which was partially funded by CrowdLords Investors. The property is in close proximity to the University College Birmingham, Newhall Square, Paradise Circus and St George’s Urban Village Enterprise Zones. This property is currently being developed as planned, and will deliver 58 high-spec apartments in Q2 of 2018. To learn more about this investment, please click here. Prosperity have many more development coming up, and plan on exploiting the Enterprise Zones while the Big City plan is still in it’s early stages, in the mean time, visit CrowdLords today for investment opportunities.